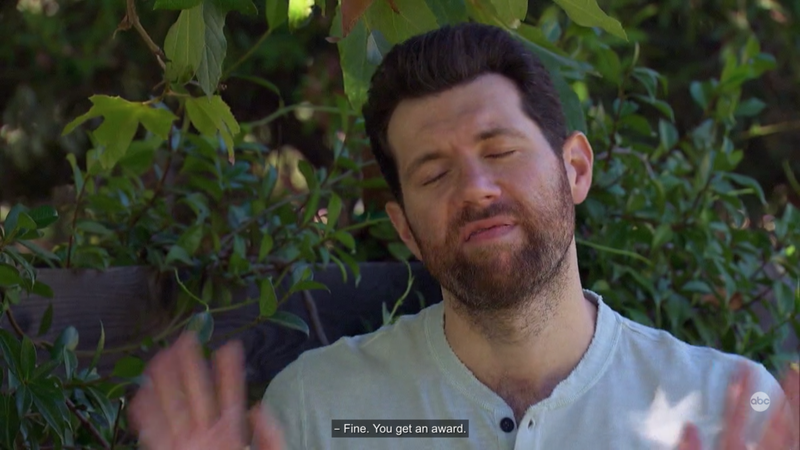 Last night, as I settled in for the second episode of The Bachelor, I was pleasantly surprised by the appearance of Billy Eichner on the second group date. Billy Eichner, clearly not excited to be on The Bachelor, tried to make the best of it. Or just make fun of it while he was there. But let’s back up a little. Colton Underwood, 26 — who has previously dated Aly Raisman — is a pretty boring Bachelor (so far). Most of the contestants are like 23 (yikes). And this date was a “summer camp” theme (fun?). Colton, have you seen “Billy on the Street”? Have you heard of “let’s go lesbians, let’s go!!”? Have you watched the carpool scene in Parks and Recreation that I legitimately cannot even think about without laughing? (She DROVE me here!!!!) Did Colton request Billy’s presence? Who thought this was a good idea?? There have been rumors about Colton’s sexuality within “Bachelor Nation” (the fandom surrounding the Bachelor franchise), and outside the fandom (see: this blind gossip). While Colton’s status as a virgin shouldn’t be linked to being possibly gay, and speculating about somebody else’s sexuality is pretty gross, we are glad it was Billy Eichner who brought it up. i don’t want to vocalize my controversial bachelor opinion so i’ll just say that when billy eichner made a joke about the bachelor being gay, he gave the same “im not gay” laugh that i gave until about 2011. I actually do think it would be cool to do a gay season of The Bachelor … and hey @BachelorABC I’m single….. There have been some very tiny baby steps. Let’s remember that viral moment from Bachelor Vietnam when two female contestants admitted their love for each other. And on Arie Luyendyk’s season, there was a bisexual contestant, Jami King, but her storyline was handled very poorly. If Colton is gay, or bi, or just not straight, I honestly think viewers would be very excited about this. But truly, I cannot see it happening. Thanks, Billy. Please come back every week, okay?